Grande Prairie First Aid is one of the best training service providers of cardiopulmonary resuscitation (CPR) training in Alberta. CPR training courses in Alberta are now in high demand as more employers and schools have started requesting certification from St Mark James. The Grande Prairie First aid website has a complete list of offered classes, rates, and schedules. Why choose Grande Prairie First Aid? Grande Prairie First Aid allows students to register for a program through e-mail, telephone call, or in person during business hours in any of the centers in Grande Prairie. Registration forms can also be found on the Grande Prairie First Aid website. Course rates are very affordable and are actually the cheapest rates in the area. Rates are paid once – during enrolment – and include taxes, certification fees, and St Mark James training manuals. Trainees who drop out are even entitled to full refunds, as long as a 72-hour notice was given. 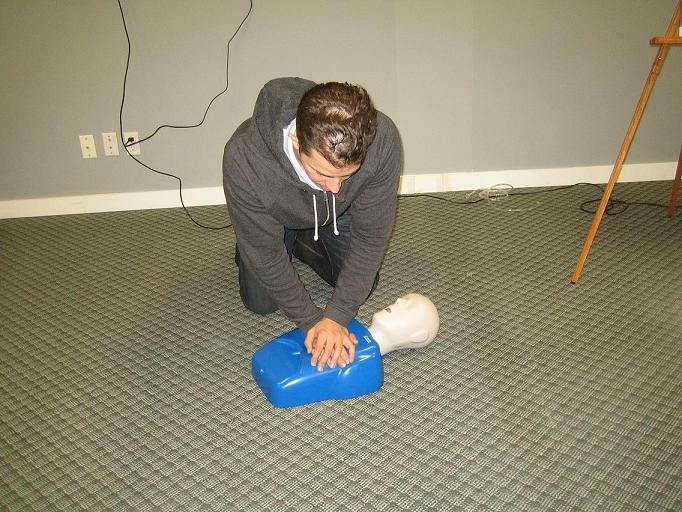 CPR training courses in Grande Prairie cover CPR, automated external defibrillation (AED), and first aid training for emergencies such as cardiac arrest, heavy bleeding, and choking emergencies. CPR classes have three levels: “A”, “C”, and “HCP”. Each level caters to a particular target audience and covers different victim age groups. Chest compressions should be started before assessing airway and breathing. Levels A, C, and HCP last four, five, and six hours long respectively. To complete and pass a program, the student has to have complete attendance, adequate skill demonstration, and get at least 75 percent on the written exam. Certificate cards from St Mark James are awarded upon completion of the training course. Wall mount sizes of the certificate are also available. Certificates are only valid for three years and participants can attend re-certification courses prior to expiration of awards. Recertification classes for levels C and HCP are available twice weekly, lasting four hours long. All instructors at Grande Prairie First Aid are certified by St Mark James. Private instructors are also available with hourly fees. So if you want to book a trainer for training at home or for a special company event, you can do so with Grande Prairie First Aid. Human bites are not a common injury but victims can get them from fights and similar events. They can be dangerous as an animal bite because of the different types of microorganisms in a human mouth and saliva. Getting your knuckles cut on teeth is also considered a human bite. Stem the bleeding with light pressure using a clean piece of cloth, gauze, or bandage. Clean with iodine (optional) and apply antibiotic cream. Place a clean bandage on the wound.